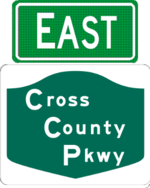 The Cross County Parkway is an east-west freeway across southern Westchester County connecting the Saw Mill River Parkway and the Hutchinson River Parkway. Initially a four lane undivided parkway, a toll barrier in Fleetwood was removed in the early 1950s, and reconstruction as a modern highway was complete by 1984. 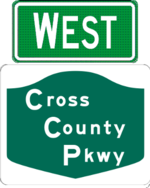 A proposal to extend it to the Playland Parkway was cancelled in the 1970s.